St James' Well is still visited to this day, on the feastday of St James. 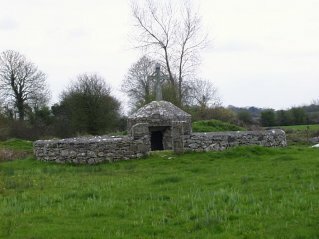 Rounds are made at the well, which is located in the townland of Ardgoul. A cross was erected over the well in May 1982. The cross has a little shamrock in the centre. 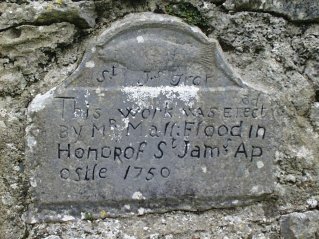 According to a plaque on the well, it was covered by Matt Flood in 1750. The well is supposed to have dated back to before the time of St Patrick. Local tradition has it that it dates to Pagan times. Originally dedicated to a holy man, a follower of St Patrick, it is believed that the Norse were responsible for rededicating the well to St James. In the past the field beside the church was used for holding fairs. You would see a large trout in the well if your wish was to be granted . The well moved when vegetables were washed in it. The landlord filled in the well and the well appeared in a new place and the water from the well will not boil.